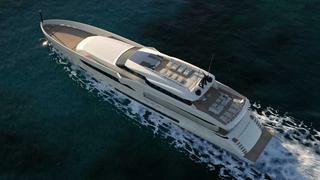 Italian builder Wider has unveiled a 45.7 metre yacht concept that offers low fuel consumption and a convenient, convertible design. The Wider 150 is powered by a hybrid diesel/electric propulsion system, which allows it to reduce energy consumption when high speeds are not required. It has a range of about eight hours and 56 miles when running on the electric engines, powered by batteries only, even with all onboard appliances in use. If diesel feeds the engine, another three speeds and ranges can be achieved. If diesel and electric are used together, the yacht can reach a top speed of more than 20 knots. The 150’s composite construction and semi-planing hull also help to minimise drag, optimise speed and thereby reduce the amount of fuel required to reach a desired speed. Ingenuity is also apparent in the superstructure design by Fulvio De Simoni. It features a 10m Wider tender housed in the transom, which has a floating launching system that allows it to power straight out of the yacht. This is a feature more common on far larger yachts, but the designers have employed a creative solution that prevents it from adversely affecting outside space. The gap left by the tender becomes a saltwater swimming pool, and two wings can be opened from the side of the transom to join with the aft platform and form a spacious beach club. The forward area of the concept houses two more tenders and a covered garage that can accommodate two jet skis or a Tesla Roadster electric sports car. Upon request, the deck above this can be raised to become a touch and go helipad. The concept features four guest cabins, four crew cabins, and a master cabin with panoramic views on the upper deck. Layout and furnishings can be tailored to clients’ needs.